Toddler Books About Robots ~ SOUND IS FUN! 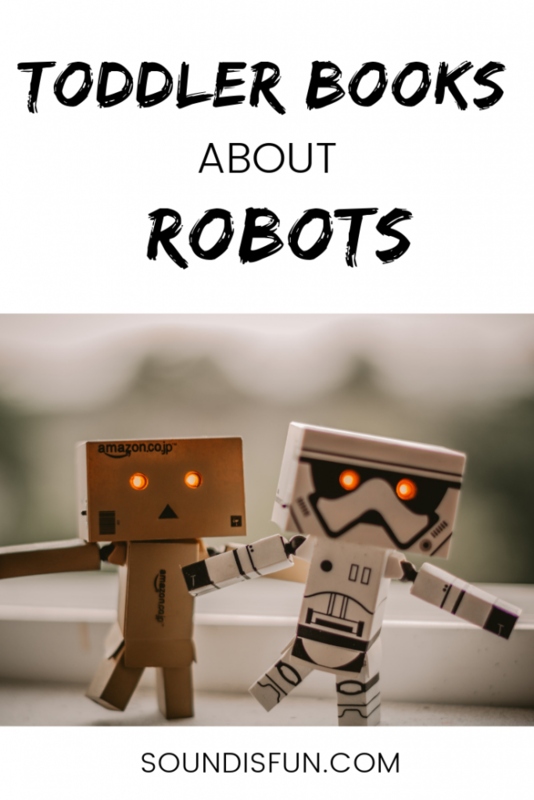 It might seem odd to read about robots on a blog about sound… but I’m a mom in tech and my toddler is obsessed with robots! Bringing sound into it, you can use robots as a way to get a toddler to listen and get creative verbalizing sounds. You can talk about concepts like quiet and loud, high sounds and low sounds, and sound localization (“where is that sound coming from?”) using robots. You can also make up sound effects like beeps, blops, and whooshes. We make robot sounds a lot in our house – everything from robot arms clicking or clanking to robot jumps with boinks. I’ve seen some cute robot books that make sound (buttons with pictures you push). In general, I’m not a fan of books that make noises. The sound quality is so poor and I think it takes away a child’s desire to use their imagination. Imagination isn’t just about seeing things in your mind – it’s about hearing sounds, too. We love Boy + Bot, the story of a boy who becomes friends with a robot until the robot stops working (spoiler: his power gets shut off). This would make a great gift because it’s a nice-sized hardback book (with regular paper – not a board book). Amazon has a Kindle version, as well. Robots, Robots Everywhere! is a Little Golden Book with tons of different robots. They even get into real robots and automation like vacuums and machinery (but in a way toddlers can understand). From reviews, it looks like some kids are reading this as old as 5 so it’s a book you may get a few years of use out of. If I Had A Robot by Dan Yaccarino is a cute story from a boy’s perspective about what a robot could do for him (like eat his vegetables and kiss his Aunt Louise). Robot Kitties by Jim Benton. This is a simple board book that’s good for young toddlers (and infants). The language is pretty basic but it’s still a fun book about robot cats. That’s Not My Robot is a cute Usborne board book (from their Touchy-Feely series). The robots are big, bright colored and it’s perfect for teaching about body parts.